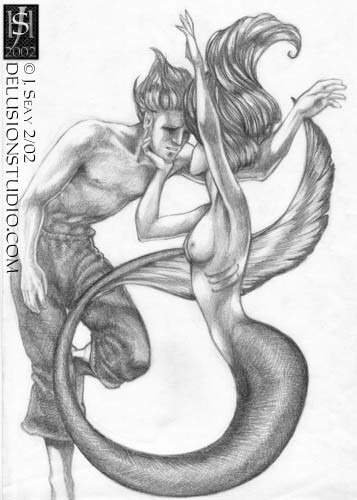 These are some of the inbetween stages for Mermaid and the Sailor. As Mermaid and the Sailor was drawn while I was at an airport, I didn't have the opportunity to scan the rough sketch or any stages leading up to this. The image to the left is what I had finished by the time I returned home. Then it sat around for a few months. What a difference some shading makes . . . When I returned to the piece and began working on it, I ended up redoing the shading on her upstretched arm, redoing the anatomy of his arm and shoulder, and then finishing the shading. At this stage, I thought I was done, but I gathered some comments from friends and ended up refining a few things. The differences between this image and the one above it are very subtle. Most obvious, I changed some of the shading on his face and his right pant leg. I just cleaned up the image in general. The finished image is here. Thanks to the many talented people who can code and provide their stuff online for people like me, this site looks great. Beautiful java applet liquid/ripple effect used on title graphic and elsewhere made by Tarek Fouda.